Energy-efficient construction and restoration are hardly thinkable these days without intelligent building control. Today, many functions can be realised without any problems, and complex tasks can be solved sensibly. It is important that the building technology can be surveyed and controlled easily. For this purpose, Gira offers two new operating panels for wall installation. 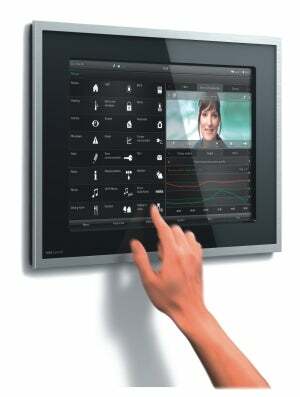 The Gira Control 9 Client and Gira Control 19 Client touch panels are operating devices for the KNX/EIB system. The designations 9 and 19 refer to the screen diagonals in inches; they are equivalent to 22.86 cm and 47 cm, respectively. Both devices must be connected either to the Gira HomeServer 3 or with the Gira FacilityServer. Using the two touch screens, the user can have an eye on the entire building control – and keep it under control as it can be operated intuitively with just one finger. The Gira Interface displays the individual functions clearly and concisely and thus provides a good overview and easy access. By gently touching the TFT touch display, processes such as light switching, dimming or blind control can be carried out, as well as saving and calling up lighting scenes and listening to music. Menu guidance is easy to understand and allows fast access to the desired functions on both devices. All the functions can be called up within only two menu levels. Detailed information and individual operating elements are displayed in additional pop-up windows. The display is easily legible from all directions. In addition, LED background lighting also guarantees that it remains easily visible and legible in poor lighting conditions. The Gira Control 19 Client is not only larger, but also in part more powerful than its "little" brother. With it, alarm messages and trend diagrams can be displayed, such as energy consumption. E-mails can also be called up and Internet applications can be used and integrated. The Gira Control 9 Client and Gira Control 19 Client are recessed into the wall. The aluminium cover frame includes a glass surface – the glass is available in the colours black, white, mint and umber. With this feature, the two new touch panels optically match the high-quality Gira Esprit glass and Gira Esprit glass C switch ranges. Through the integration of a microphone and loudspeaker, the Gira Control 9 Client and Gira Control 19 Client can also be used as home stations for audio-visual door communication. In this case, the new touch panels complete and replace the traditional Gira home stations. A prerequisite is the installation of a Gira DCS-IP-gateway which converts the signals of the DCS bus to IP network protocols. The Gira DCS-IP-gateway can also be connected to the Gira HomeServer 3 via a plug-in. With it, the Gira door communication system is integrated in the Gira Interface user interface. In addition, the Gira Control 9 Client can be connected via IP network protocol to the new Gira nurse call system 834 Plus, which will be available from April 2011. The device can be used as a duty room terminal – as a central control and operating unit for the duty room of a medical or clinical practice, compiling the information from the various patient rooms and surgeries. Representation with Interface also enables the personnel to operate the system simply and conveniently with just one finger. All the functions are displayed clearly, intuitively and understandably on the touch screen.